There is something to a really good music/rhythm game that really can capture my attention. I am not a Guitar Hero or Rock Band kind of guy; the peripherals would make my stupidly cluttered apartment ever worse (which is not something I am willing to do, I need that space for writing materials and tiny Star Wars ships), and to be perfectly honest, the song lists are always going to be missing some of my favorite genres to listen to: EDM. Eating lunch one day, and perusing through YouTube videos, I noticed that Kinda Funny Games had put up a 'Let's Play' video for the Kickstarter funded Amplitude, which was coming to PS4 soon; a reboot (or as they like to call it, recharge) of a cult-hit PS2 game, wherein you fly a little ship and blast notes in a sort of hybrid rhythm/action game. Now as I have said, I'm not generally a rhythm game guy, but I was a fan of the pseudo rhythm series Patapon on PSP, and...and this is a real callback, was completely enamored with the often insane Gitaroo Man on PS2 (seriously...it was crazy), but there was something about watching the guys at KFG play it that got my attention. Thankfully, PSN had a demo for it, so I could give it a whirl on my own...and bam. 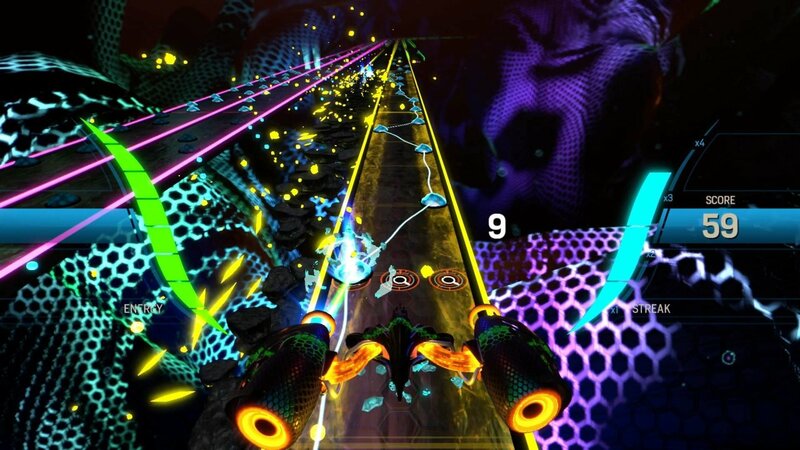 What is it about Amplitude that really nails it for me? This means that the game, which uses your standard controller, is really east to pick up (once you figure out the control scheme that works the best for your brain--I do not use standard), but very, very difficult to master. QUICKPLAY actually means quick to play in this game--so many times you have menu upon menu to get to quick little chunks of the game; not so with Amplitude. I often find myself with a 15 minute gap, which is perfectly filled by being able to play roughly 3 songs in quickplay in rapid succession as I try to get my scores up the leaderboards. The 20$ price-point for Amplitude was absolutely perfect; while it does not have a clock telling me how much I have played the game (or if it does, I'm too busy playing a 3-5 minute song level to find it), I know I have already, easily, gotten my money's worth out of it. The gameplay is smooth and fast, the menus intuitive, and the different difficulty levels (and those 'rivals' leaderboards, showing you random scores, as well as what percentage your score puts you in relation to rest of the community) make the game's replay-ability ridiculously good. Amplitude is one of those game that I know I will keep coming back to, whenever I have a little bit of time, and I hope against hope that they will be able to release some song expansions for it, so that way once I do master these 30 (at present, I am ranked in the top 10% of players, and I haven't played every song yet), that there will be something that brings me back to play another 20 hours. If you are looking for a rhythm game on PS4, and are in to EDM (this being key, as there are very, very few tracks that are not dance), I cannot recommend Amplitude highly enough. It's just as addictive as all the others, with a way softer impact on the wallet, and space, and I for one love it to bits. I've Stopped Running From Monsters and Now Make Soup: "Nom Nom Galaxy"